The Beatles …The night that changed my life. 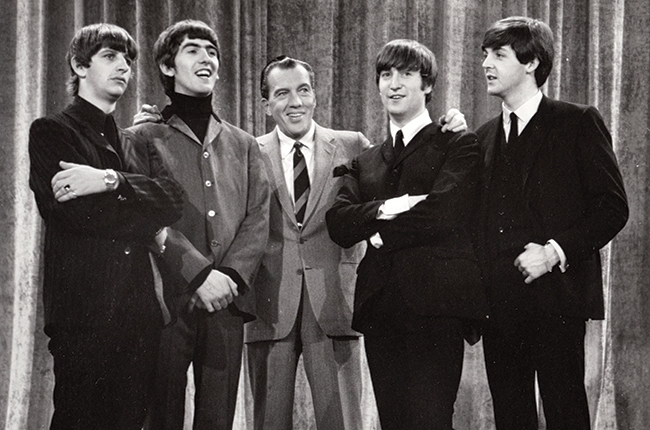 Last night I watched the television special on the 50th anniversary of the Beatles on the Ed Sullivan Show. It seemed like yesterday. I recall that evening quite vividly as my brother Michael and I watched the show with my parents and sister. Now previous to that evening my brother and I had always emulated our older brothers. They had the slicked back hair with the ducktail, road motorcycles, played guitars and in general seemed like cool cats in our world. They were a James Dean and Elvis mashup. In that era a “little dab will do ya” was the mantra. Yes standing in front of the mirror you would squeeze out Brylcreem to help grease back your hair. If you were in a pinch you could always grab a dollop of petroleum jelly for that frozen in time look. Yes we were unabashedly greasers. We lived in Stratford and my father, a chiropractor was friends with the GM of the local radio station CJCS. For us a great bonus was that station was anything but the pop music of the time. They were sent stacks of 45’s that they never wanted and fortuitously for us we were the recipients of stacks of wax. Around the time of the Ed Sullivan premiere of the Beatles we had heard them but really never seen them. That all changed that Sunday night. Now we were not one of those screaming girls but those guys had all those screaming girls. Who wouldn’t have wanted that circumstance as a young lad? The showcase was in two parts, two songs at the first half and other songs in the last half. When we saw them perform for the first time it was like a sledgehammer hit you in the head. Adults hated them which made them even more precious to the young. Their look was no longer the greaser look they had sported in Germany but new, radical and unique. I recall my brother and I immediately after the first part of their set booking to the loo and changing our hairstyle instantaneously. Boom ….we had changed from rockers to mods and we never looked back. I am sure that is a most common story for countless young lads that experienced that Sunday evening. That night was a musical and cultural tipping point. The Beatles of course went on to influence the entire musical world. They had their influences from many of the American Bluesmen, Buddy Holly and of course Elvis. It was their turn now to not only step outside the box musically but to completely decimate the box and musical formats of the time. Half a century later and what does this have to do with a chiropractor writing a chiropractic blog? Well I guess we can say time keeps on slipping into the future and their premiere seems like yesterday. Don’t take time for granted and don’t take your health and wellness for granted. Take action.